This was the question I was asked at my very first meeting with Amy and Lee. But more about that a little bit later. On Christmas Day last year, my wife and I received a text message that went on to cause a lot of excitement within our friendship group. Our two dear friends, Amy and Lee were engaged!!! This was wonderful news. I couldn’t be more delighted, until they asked me to be their celebrant. What an honour! Amy and Lee are two extraordinary women. At the time of their engagement, they had been a loving, committed couple for almost fourteen years and had started a family together. They describe their relationship as head and heart. They are adored by all who know them and are simply an inspiration. Their ceremony was going to be a special one. And it was - for everyone. It was also a wee bit sneaky too. Skip back to our first meeting. Amy and Lee had a secret to share with me. 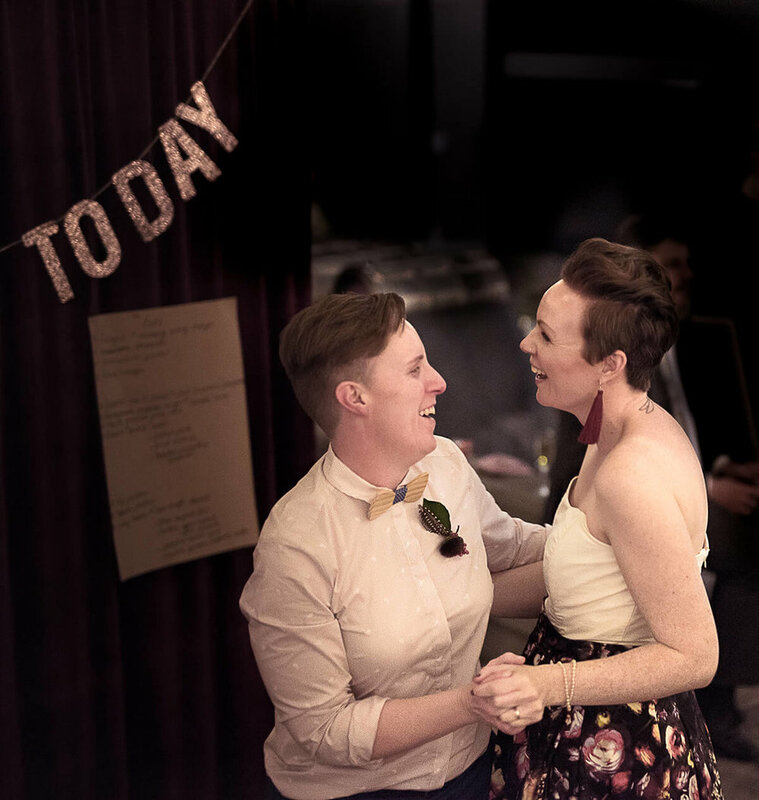 As they had family in Victoria who were unable to travel, and their fourteen year Anniversary was on the Monday prior to their planning celebration, they had decided to get legally married in Melbourne, in a private ceremony with their family on the actual day of their Anniversary. Then, they would throw a huge second ceremony in Hobart, for all their friends to enjoy. But it had to be hush hush. No one was to know until the big day arrived. Normally this kind of thing would be simple. Everything to do with a couple’s ceremony is between them and the celebrant until the big day. But knowing many of the people going to the wedding, including my wife, was going to add an element of complexity. We managed to keep a lid on things. Having two ceremonies also meant that we could shape their ceremony exactly how they wanted it. In the end, there was laughter, reflection and just a few tears. There was a significant amount of guest involvement, including the lining of the path from the entrance to the ceremony stage and a brilliantly loud “Vow of Enjoyment”. The ladies themselves read their vows as one, sharing a line each one-by-one. A beautiful moment. It is always so special to be part of a life ceremony of close friends. The best part is being able to stand so close to them and feel the emotions they are experiencing. What I felt that day, was their pride.